I received news of an interesting survey recently. 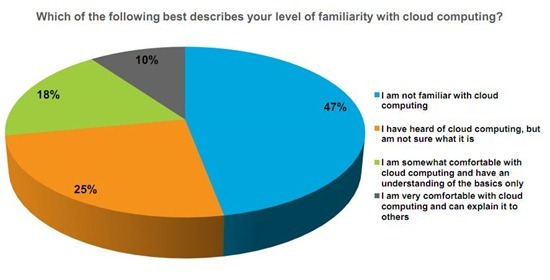 In a study of over 500 decision makers in business under 1000 employees, when asked about cloud computing, well over half of respondents replied that they are “not sure what it is” or are “not familiar” with what the term actually means. Meanwhile, in this survey at least, only 10% of respondents either have, or are aware they have, deployed cloud solutions. It’s a telling survey and one which speaks to my ongoing theme of cloud computing education for the real world. The reason I first started the CloudU series of reports and webinars, was that, like me, sponsor Rackspace was aware that, outside of the early-adopter set, the actual knowledge about the cloud was very limited. I’ve been ruminating over the causes of this and something I keep coming back to is the disconnect between how technologists articulate their wares, and what the actual users of technology understand. Let’s face it, we are some of the biggest users of buzzwords, acronyms and industry lingo, second only perhaps to the medical profession. In the case of the aforementioned study – perhaps years of products with a “cloud” prefix, or multitudes of _aaS nomenclature do little to actually show customers just how enabling technology generally, and the cloud in particular, can be. It’s a theme that I’ll be revisiting in a couple of weeks at GlueCon when Robert Collazo and I will be co-presenting what (hopefully) will be an entertaining and light-hearted session, but one with a serious theme – Translating Technology, when Geeks and Customers Collide. The aim of the session is to show just how disconnected the language of technology is from the users of that technology. We’ll also try and give some guidance to technologists who actually want to connect with the users of their products. I’m looking forward to the session – Glue is an amazing event that has a real technical focus. While our talk might be anything but technical, I believe that messaging for the real world is a critically vital part of bringing technology products to market. I hope to see you at GlueCon!